Platinum materials, diamonds, pearl wristbands... are of course a valuable part of a watch, but it is by no means a hundred percent value. Imagine you are living in an extremely harsh environment. What practical use do these platinum, diamonds and pearls have? In order to demonstrate the professionalism of excellence, each watch family has launched a super watch that can deal with various extreme dangers, so that the adventurous spirit of human beings is guaranteed by high-tech security. BALL launched the EngineerHydrocar-bonTMT, which is the world's first luminous thermometer mechanical wristwatch using the bimetal thermometer expansion principle as a design concept. Even at the 10,000-year-old ice-free South Pole, the EngineerHydrocarbonTM T can still accurately travel and accurately measure the temperature of ice cubes. Its birth breaks the industry standard that watches can only maintain accuracy at room temperature, and the EngineerHydrocarbonTM T measures ambient temperatures from -35Â°C to 45Â°C. In addition, the EngineerHydrocarbonTMT makes a new definition of concepts such as antimagnetic, shockproof and waterproof, and is the world's first mechanical watch capable of resisting impact force of up to 7500Gs. Its self-illuminating micro-miniature light on the dial is 100 times brighter than usual, and it can last for 25 years. AudemarsPiguet has continued to fully prepare for the 2007 America's Cup race after following the entire America's Cup in 2003, and has designed a brand new Royal Oak off shore for the support of the America's Cup champions and all sailors. AlinghiPolaris chronograph watch. The design of this watch is inspired by the Polaris that pointed the direction for the traveler in the long black in ancient times. AlinghiPolaris is a watch that is perfectly suited to complex starting procedures because it is equipped with a red minute hand that rotates the dial once every 10 minutes. AlinghiPolaris is also equipped with a rotatable dial outer ring to indicate the direction, a lock-in crown at 10 o'clock, just a little twist, you can know the direction of the sun to the northeast and southwest, this feature in AudemarsPiguet The watches that were introduced in the past have never appeared. 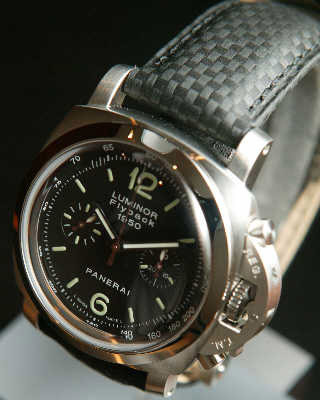 Panerai launches different styles of diving watch every year. The depth of the submersible is also being broken every year. This limited-edition watch with a diving depth of 2500m is Panerai's hard work. From the appearance point of view, LuminorSub-mersible2500m uses Panerai's unique sandwich surface, the details of the design is also very delicate, 47mm case with titanium and matte steel to create, highlighting the strong male charm, the surface of sapphire crystal glass Made of and anti-reflective treatment. The hands, scales and self-winding movements are painted with a luminous paint, ensuring that you can still see the time accurately on the deep, dark, dark sea floor. The infusion of babao tea requires the addition of boiling boiling water, so that the taste of each shot of tea will change slightly when drunk, because each ingredient releases its unique taste at different times. Is in the choice of ingredients, usually according to the order first put rock sugar, then put the Siraitia grosvenorii, then American ginseng, licorice, Wolfberry fruit, red jujube, raisins, finally cover ingredients with jasmine tea, put two chrysanthemum. So rushed out of the tea soup color green, and can show you to elegant chrysanthemum. Drink with tea cover to float on the chrysanthemum gently through the first, and then gently sip, first taste is a shallow taste, swallow down after there is a faint scent, taste very good, make people relaxed and happy, that kind of special taste, let a person feel very satisfied. It can be said that babao tea and tea division has become a beautiful scenery line in Sichuan. The so-called " three fort", in fact, is used to even cover the tea bowl and base plate three head, northwest people called three fort. Tea with this tea set, cover can keep warm, end up tea and not hot. As for the so-called " babao tea", generally by Maojian, fuzhuan tea or pu 'er tea with crystal sugar, red jujube, longan, white raisins and nuclear apricot and other mixed together to drink; Sweet and sweet, and tonic. We are manufacturer of Bulk Tea in China, if you want to buy Blooming Green Tea, Bulk Black Tea, Black Tea Bulk, Bulk Organic Tea, please contact us. The development of the company is inseparable from the trust and support of customers.We strive to make every product to customer satisfaction. Welcome to consult.